Red Dead Online's beta is well underway. But with such a massive open-world to explore in Red Dead Redemption 2's single-player story, why should you be excited about the game's online mode? Rockstar's open-world Western game, a prequel to 2010's Red Dead Redemption, was released to wide critical acclaim last year and was all anyone could talk about for months on end. 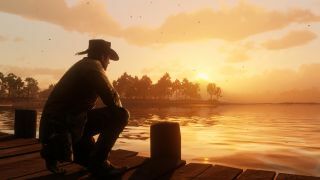 While you might have expected an online mode to be live from the game's successful launch, it makes sense that Rockstar wants you to focus on the main story – and boy is there a lot of it – before waltzing into a less narrative-driven multiplayer experience in Red Dead Online. Red Dead Redemption 2 on PC: could it happen? Rockstar has proved itself at converting a massive single-player game into a lively online experience, as shown in the launch of GTA Online in 2013, which has become almost as massive a phenomenon as the mainline GTA V game it spun off from. So what can you expect from Red Dead Online, and how can you access it? You can access the Red Dead Online beta by selecting the 'Online' option from the Red Dead Redemption 2 title menu (at the top-right hand side of the screen). The latest Red Dead Online update sees players earning 1.5X more RDO$ and Gold by jumping into Showdown Mode, Race or Gun Rush for one week only. In addition, players can earn 1.5X Gold in A Land of Opportunities Missions, and all Free Roam Missions and Free Roam Events. Plunder Showdown mode sees up to 16 players form teams and battle to capture supplies from a central location and bring them back to their bases – or strategize to plunder them from a rival team’s base. This new Showdown Mode puts players in a race to raze the opposing team’s base by delivering explosive packages - each successful delivery will cause another piece of a rival’s camp to go up in flames. The team who deals the most damage through successful deliveries wins. Now offer a 30% experience boost. The Fishing Challenge sees players competing against others to catch the most weight in fish, with variations across three different body of water types: lakes, rivers and swamps. A team-based capture-style mode for 2-16 players, and the latest addition to the Showdown Series of competitive matches. All Showdown Modes are also delivering 20% XP this week in addition to a bonus of 8x Dynamite Arrows for the first Spoils of War match win. Each week will see the addition of rare 'limited stock' items in the catalog. Can now be picked up directly from the Rawson, Wheeler & Co catalogue or at any gunsmith. This new event sees you battling other players to wear the Golden Armor, taking down opponents while wearing it to earn points. You can also score points by taking out a rival player that’s wearing the Golden Armor, which then puts the armor up for grabs to whoever reaches it first. Cold Dead Hands: Fight for control over a target for the longest amount of time. Competitive Challenges: Compete to get the highest score in a given, randomly-selected challenge within a set time limit (currently includes Bow, Headshot, Horseback, Longarm, and Sidearm Kill Challenges). Dispatch Rider: Posses compete to be the first to deliver a horse to the assigned destination. King of the Castle: Compete to gain and maintain control of the castle area by staying alive inside of it - whoever controls the active area for the highest percentage of the event time wins. Master Archer: Compete to score the most points by hitting the most targets as accurately as you can within the time limit. Reducing the visibility of blips over long distances – your map position won’t display to other players unless you are nearby (within 150 meters) and if you are slightly further away you will only appear when firing your weapon. Overly aggressive players will become more visible to other players with a progressively darkening dot that incrementally shifts from blue to dark red. Your visibility increases through bad deeds such as attacking and killing other players or their horses outside of a structured mode, free Roam mission, event or competition. The shorter the time between bad acts, the more your visibility increases - to warn others of your misdeeds. If you decide to be more wholesome, then your dot will gradually return to normal. The introduction of posse-wide parleys and improving feuds will mean that you'll be able to initiate parley that applies to your attacker’s entire posse after just a single kill. Alternatively, if you’d rather challenge your opponent, you can initiate a feud, posse Feud or leader feud after one kill, quickly turning a dispute into a timed mini-deathmatch for rival players to fight out amongst themselves in free roam, earning points for each kill on the opposing player. If you rack up a high bounty then you will have a chance of being targetted by NPC bounty hunters who will attempt to kill you and collect their reward. Criminal behavior will have bounty values and honor consequences that scale based on the severity of the crime. Daily challenges will see you complete individual objectives that cover every aspect of life on the frontier to earn gold nuggets and XP. Challenges will range from foraging for herbs, selling items at a fence, hunting and skinning animals, clearing hideouts, winning feuds and more. A week after the public beta went live, Rockstar released a statement on the game's status, which stated the developer's main focus right now is improving the in-game economy and bugs. "Your feedback from these early days will be instrumental in helping formulate updates to every aspect of the experience," the statement read. "Our current areas of focus include the in-game economy, which will require some additional balancing in order to ensure all activities are appropriately rewarding and fun, as well as some persistent bugs that are causing some players to be kicked from sessions. "The game has been developed so that we will be able to quickly make any adjustments like these, and we plan to get updates out as early as the end of this week with more updates to come next week. Feedback from the community has been invaluable, and we will continue to keep you regularly updated as things progress." Rockstar then rolled out its first set of "adjustments" to the Red Dead Online beta which aimed to a create a "more balanced, fun and rewarding overall experience, across all modes and missions". This included increasing cash and gold payments, reducing prices of weapons and balancing the values of select pelts, skins and fish. Rockstar added a battle royale Gun Rush mode, which sees up to 32 players "scrambling to gather weapons and ammunition in a rapidly shrinking play area". Rockstar added a attle royale Gun Rush mode, which sees up to 32 players "scrambling to gather weapons and ammunition in a rapidly shrinking play area".ke changes based on player feedback such as adding daily challenges, upgrading the law and bounty system, changing parley and decreasing proximity-based player blips. In addition, Rockstar is "working on lots of new content" that is due for release this year. This includes all-new missions, dynamic events, more competitive modes, and new weapons and clothing. Finally, Xbox One players can also now access the red chestnut Arabian horse, alligator skin ranch cutter saddle and the high roller double-action revolver. Shootout / Team Shoutout - Essentially classic Deathmatch, which sees you aiming to get the most kills either individually or as a team. Most Wanted - Sees you battling against opponents to get the most kills and become the 'Most Wanted' person on the leaderboard. Make It Count - Red Dead Redemption 2 Battle Royale mode. Name Your Weapon - You are awarded more points for killing enemies with more difficult weapons (either played as a team or individual). Hostile Territory - Capture the flag except you get points for capturing territories. Red Dead Online's character customization is very detailed, with options to adjust everything from your age to your facial dimensions - allowing you to make your perfect cowboy or cowgirl. Now that we've been able to take part in the beta, we know Red Dead Online allows you to take part in a variety of activities such as co-operative story missions, treasure maps, PvP, hunting, fishing and free-roam missions. An official announcement for the online service read: "Using the gameplay of the upcoming Red Dead Redemption 2 as a foundation, Red Dead Online will be ready to be explored alone or with friends, and will also feature constant updates and adjustments to grow and evolve this experience for all players." We definitely hope the minigames will be playable online with your friends – card games, knife games, drinking games, and all that other wholesome fun you cowboys get up to. One of the things we love about Read Dead Redemption 2 is the thoughtful pace – so we're hoping the online mode doesn't go too octane for the rustic cowboy setting. We want to take a slow trot to the saloon before beating our friends at poker, or lying in the undergrowth while we wait to rob an incoming train – not a 6v6 deathmatch on flaming ponies. Okay, as much as we love the core Read Dead experience, the last game's Undead Nightmare DLC was a fantastic adventure in its own right, raising the dead in what felt like a serious Western blended with a camp horror movie. It was too good an experiment not to resurrect this time around – we hope. We haven't seen cross-platform play for a Rockstar game before, though the CEO Strauss Zelnick has been open about his desire to overcome traditional console distinctions for online play. We'd love to see PS4 and Xbox One owners play together in Red Dead Online's wild west, though Sony have also proven themselves a stickler on this point in the past – even if it eventually succumbed to pressure on Fortnite cross-platform play.